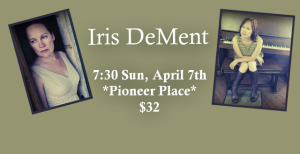 Iris DeMent is another of the big names in the singer-songwriter world–Merle Haggard called her “the best singer I’ve ever heard,” and she has performed and recorded with Haggard, John Prine, Ralph Stanley, Steve Earle, and Emmylou Harris. Her songs have turned up on movie and TV soundtracks (Northern Exposure, Little Buddha, Songcatcher, the Coen brothers’ True Grit) and on the set lists and recordings of admiring colleagues. 203-0331 or buy on-line at www.ppfive.com.